Pictured from left sitting: Schroeder (Creed Kidney), Snoopy (Madi Blake). 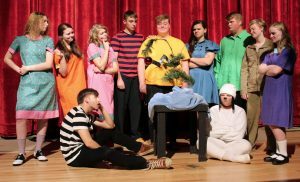 Standing: Frieda (Leah Reuschel), Patty (Justice Robinson), Sally (Kailey Filben), Linus (Luke Cramer), Charlie Brown (Ben Games), Lucy (Emily Anderson), Shermy (Brayden Snider), Pig Pen (Paige Wallace) and Violet (Lauren Brannen). The holiday television classic A Charlie Brown Christmas comes alive on the John Marshall High School Center for Performing Arts stage in Glen Dale in a new production of the theatrical adaptation. Monarch Company is presenting this wonderful, musical take on the real meaning of the holidays. The show runs on Saturday, December 1 and Sunday, December 2, 2018 at 2:00 pm. Tickets may be purchased at the door or in advance by calling 304-843-4444, extension 160. With direction from Tracey Filben, this production of Charles Schultz’s holiday story brings John Marshall performers to the stage as such classic characters as Lucy, Linus, Schroeder, Snoopy, and, of course, good ol’ Charlie Brown himself. The production contains the Vince Guaraldi holiday musical favorite ‘Christmas Time is Here’ as well as the carol ‘Hark, the Herald Angels Sing’. The cast of talented performers includes Ben Games (Charlie Brown), Emily Anderson (Lucy), Kailey Filben (Sally), Luke Cramer (Linus), Madi Blake (Snoopy), Paige Wallace (Pig Pen), Leah Reuschel (Frieda), Creed Kidney (Schroeder), Lauren Brannen (Violet), Justice Robinson (Patty) and Brayden Snider (Shermy).